The recent news of Maker House closing has prompted many people to ask me “why?” so here’s a reflection on venue stability and the greater dance community. 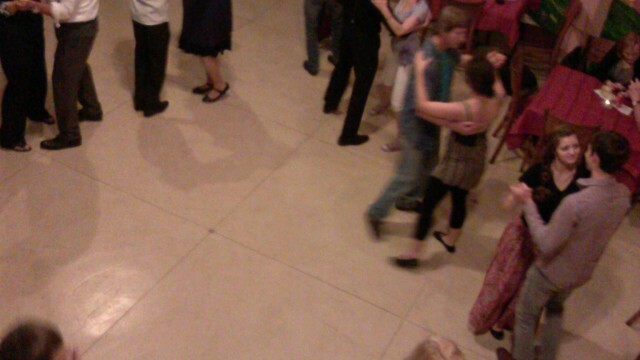 I’ve been hosting dances for 15 years now, and I’ve seen venues come and go. The trajectory started with a private space, the Shoebox, moved to Irene’s, had stops various hotels and coffee shops along the way to Casa Vicente where Tango has had our longest tenure. Along the way I’ve seen what works and doesn’t for venues, for organizers and for dancers. The most obvious but least acknowledged observation is that it is more work than people think. Someone has to have a sound system, and if it is built into the venue it will need upkeep. Although no one is surprised that electronics and liquids don’t mix, they are surprised by how often the two come into contact in a food service environment. Then there’s floor maintenance, we like a smooth floor but the same powder that makes dancing easier makes every other aspect of running a venue more difficult if not outright dangerous. Ideally the floor is cleaned before the dancers come to remove old spills, and then afterward to get our powder off the floor. There are tables and chairs to be moved, lights to be adjusted, often a water station and staffing for food/bev to take care of. All this has to happen before we even get dancers on the floor, or an introductory class to start. To those of you who have helped me pull up cables, move furniture, or any of these other tasks: thank you. I probably don’t say that enough. Once we get the physical space set up, there is the work of making an event run. Most venues want an introductory class to drive business (more on this later) and fresh blood is required to keep a scene moving. Classes need teachers, milongas need DJs, and events need promoting. Facebook works about as well as the old email lists did, in that it gets the work out to people who are already in the know. Old fashioned “dead tree” flyers are still one of the best ways to get new people in to an event, and that requires another skill set to put together. In the end, for a weekly dance + class that run from 3 to 4 hours you have triple that time in man-hours of work. The most visible parts of the machine are on the dance end, but a majority of the work goes on behind the scenes and is usually done by people working for the venue. I bring this up because the Maker House and its employees have been working their asses off for over a year to provide us with the best experience they can, beyond a clean floor and chairs to set our stuff on. There have been wine specials. The hollow floor had to be repaired. The mural is still undergoing restoration. We’ve burned out those tiny fake-candle-tea lights. There have been amazing animated backgrounds for our dancing, and they have politely kicked people out of the room before I set up the sound system every week. Each time I am amazed at the amount of work they put in. There is no direct exchange of money for it, they just hope we buy food and drinks- and maybe we will speak highly of the venue to our friends. In the end, and thru no fault of ours, this gambit didn’t play out for Maker House. Remember them fondly, and if you run into Tony, V, or Matt in the next two months stop them briefly and say thanks. V set us up in the beginning to fill out their Wednesday night lineup. Tony helped her run the show for months, and when they moved on Matt picked up the slack. When the closure was announced Matt was even working on a poster for us, so I think he was just as surprised as we were.